The work of Coastal Bend College alumnus Larry Lee Harrison II is on exhibit at the Simon Michael Art Gallery in the Frank Jostes Visual Arts Building. The gallery opening is on March 23 from 10:30 a.m. to noon. “I am an artist at heart,” Harrison said. The gallery show features glass, wood and metal sculptures and oil paintings. 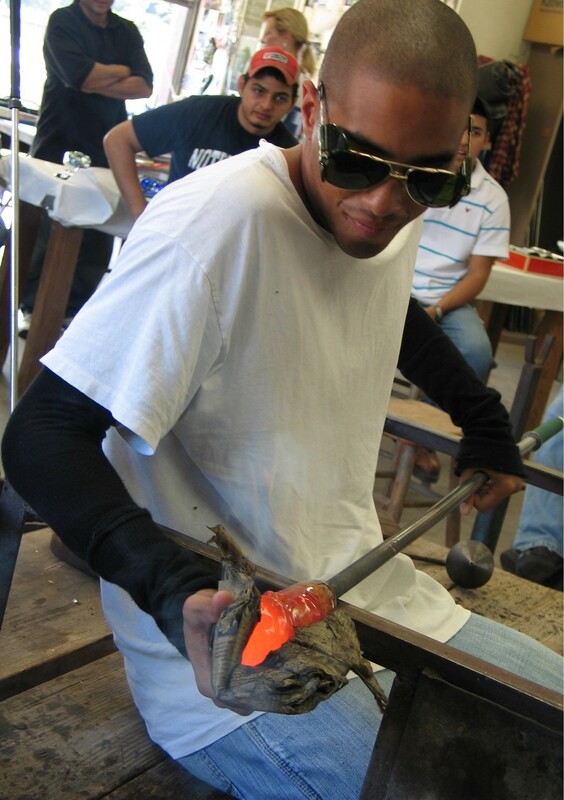 Larry Harrison, as a student at Coastal Bend College, excelled at glass blowing and painting. His work is on exhibit at the Simon Michael Art Gallery in Beeville. graduated from CBC in 2007 and transferred to Texas State University in San Marcos where he earned a Bachelor of Fine Arts Degree with a Specialization in Painting in 2009. Harrison interned at a glass company and a metal sculpting company, both in Wimberley, Texas. He is currently working on becoming a state trooper. Harrison earned the Carol Shell Shaw Art Scholarship while at CBC and sold several of his glass pieces at student gallery shows. As a student artist, he demonstrated glass blowing techniques for other students and visitors and assisted Duryea during workshops and tours. Oil on canvas subjects include Martin Luther King Jr., President Barrack Obama and Jackie Robinson. “This study is a means of pursuing ideas that reflect issues of history, race and society,” he said. The series “Obscured African American Women” includes portraits of Madam C.J. Walker, Bessie Smith and Ella Fitzgerald. Harrison said his grandmother inspired him to create this series by reminding him of the contributions of these historical figures who are at risk of being lost to time. A third series on exhibit, “A Father’s Pride and Joy,” features Harrison’s son as the principal subject. The closely cropped paintings capture his son’s earliest moments. Harrison’s exhibit closes on April 21. For more information, contact Jayne Duryea, at (361) 354-2322 or duryeaj@coastalbend.edu.